The first two are not manmade (non-anthropogenic), although our vulnerability to the effects of a massive solar flare is mostly a result of our love of cheap electronics, and electrical grids and an internet that are not sufficiently hardened. For the non-anthropogenic threats I looked at all four of the factors to determine if there is cause for concern. The rest of the list are manmade (anthropogenic). All of them present a high degree of risk and a high severity, and all but two (a human sourced pandemic and biotechnology) are already happening and very likely to intensify in the near future. The Wikipedia article on catastrophic and existential risks that I've been referencing in this series of post adds up all the various risks and concludes that the likelihood of human extinction by 2100 is around 19%. This seems fairly reasonable to me, though I'd place lower probabilities on risks like artificial intelligence and nanotechnology and higher probabilities on climate change, resource depletion, ecological disaster, and population and agricultural crises. But there is a big range of outcomes between extinction and business as usual, including various degrees of societal collapse, entailing loss of life, organization and technology. I would argue that some sort of collapse is very likely—essentially a certainty if we don't take some corrective action soon. What I haven't done as yet, for these anthropogenic threats, is look at the difficulty of mounting such a response or the likelihood of its being successful. In order to do this, I think it would be helpful if we could make some sense of all these threats and how they fit together in an interconnected, systemic context. And that is the subject of this post. If indeed there is nothing that can be done, then we should relax, quit worrying and try to enjoy the ride. But remember, these threats are manmade. We are causing the problems, so can't we just stop whatever it is we are doing wrong? I think we should at least consider it. If that won't work, another alternative would be to accept what is coming and take steps to adapt. And it seems to me that the things we might do to adapt are also things that will reduce the severity of the situation we are facing. In addition to the major threats listed above, there are also a great many minor economic, social and political disruptions happening these days which do not seem catastrophic on a global scale but may well lead us to the "death of a thousand cuts". With all this going on it is very difficult to sort out cause and effect and determine what our response should be. Conventional wisdom would have us treat the symptoms, the surface disruptions, but remains unwilling to consider that there might be anything fundamentally wrong with the system as a whole. As we shall see shortly, much of the activity that is causing our problems is economic activity. At the same time, as more and more aspects of our lives become "monetized", we are giving up the last vestiges of self sufficiency and becoming ever more dependent on the monetary economy for our continued survival. To be so dependent on the very thing that is causing our problems is not a good situation. This being the case, I think it would be helpful to look to the science of economics for a deeper understanding of what's going on. 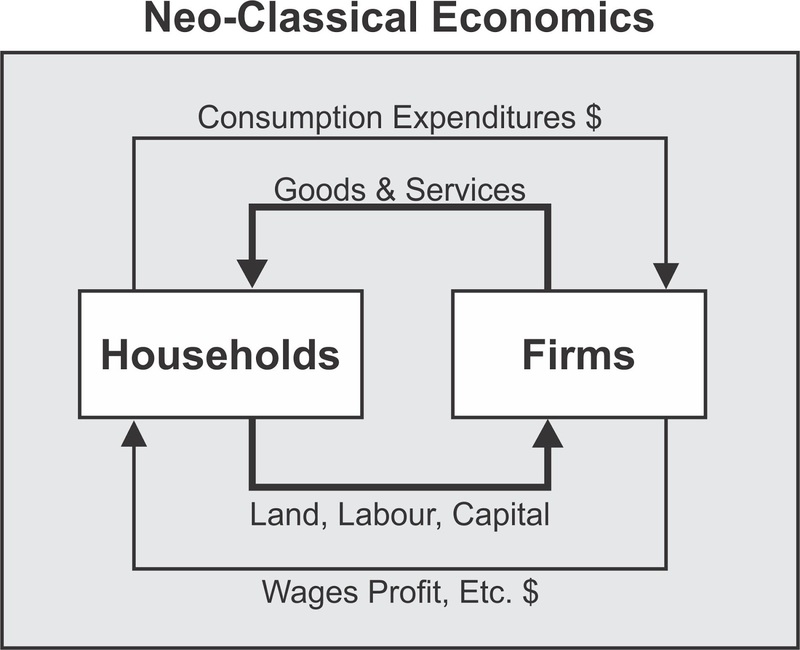 Unfortunately conventional economics (Neo-classical economics or Chicago School economics, henceforth referred to as NCE) is hardly fit to be called a science at all. It violates a number of physical laws and is inconsistent with actual human behaviour. These folks would have us look at the economy as a perpetual motion machine, in which money and goods go around and around, with no reference to the physical and biological aspects of the world, or the realities of friction and entropy. There a number of myths being propagated by NCE, and since policy decisions are based on these myths, they represent a serious handicap in our attempts to cope with the challenges facing us. 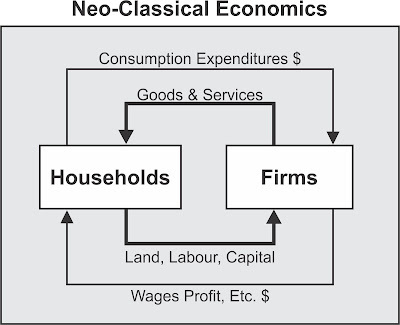 The real economy is subject to the forces and laws of nature, including thermodynamics, the conservation laws and various environmental requirements. NCE ignores these issues. Economic production requires physical work and the energy required to perform that work is a significant input to the process. NCE counts only capital and labour as inputs and when it finds that these inputs don't add up to match the outputs, it attributes the difference to "technological change". But in fact, the discrepancy is nicely accounted for by including energy as a third input. NCE ignores the economy's boundaries with the real world, disregarding the flow of energy and materials into the system and waste heat and degraded materials out of it, and any effects that those flows may have. NCE holds that a successful economy must grow, despite the fact that we live on a finite planet. It refuses to acknowledge the existence of real limits to growth. It is basic to the scientific method that theoretical models are tested and proved or modified to match reality before gaining acceptance. In NCE this is often not the case—policy is based on models that simply have not been validated. NCE is based on the idea that human beings always behave in their own best interests. In fact this is clearly not so—people are both far more altruistic and far more vindictive than NCE allows for. NCE equates consumption of market goods with human well-being. In fact, once basic needs are taken care of, further material acquisitions contribute relatively little to happiness. NCE fails to consider the importance of how wealth is distributed in a society and the negative effects of inequality. 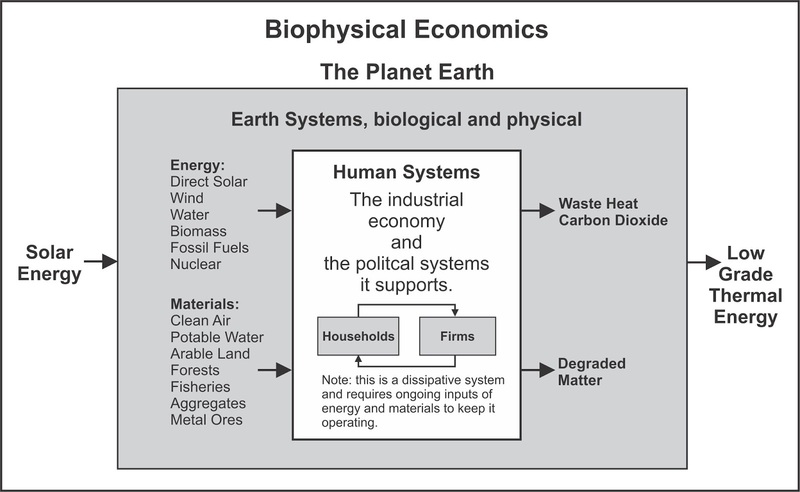 But there is a another branch of economics—"biophysical economics"—that I think has a lot more promise. It takes into account all the factors that are involved in the existential threats we are talking about, and does not commit the ideological errors about human beings that plague NCE. Figure 2 below is the biophysical version of Figure 1. Figure 2 is the "interconnected, systemic context" that links all the anthropogenic threats together and makes sense of them. Before we talk in detail about how this works, we need to have a closer look at some ideas that may not be obvious from the diagram. 1) We are looking at a complex adaptive system here—it is complex in that its behavior as a whole is not predicted by the behavior of the components. It is adaptive in that the individual and collective behaviors change and self-organize in response to events, adapting to the changing environment and attempting to increase their survivability. It is not easy to predict the behaviour of such a system, especially from the inside. Nor is there any guarantee that this behaviour will always lead to positive outcomes. Especially in a case like ours, where the individuals are human beings and groups of human beings who are not well informed about the overall situation. 2) Both the Earth Systems and the Human Systems depicted in Figure 2 are also dissipative structures. Indeed, I would say that the key to understanding what is going on in our world is to realize that this is the case, and to grasp what it implies. 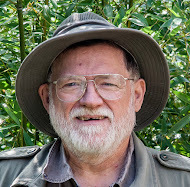 Living organisms (including human beings), ecologies and economies are dissipative structures. So are human societies. All these structures maintain themselves by taking in energy and materials and giving off waste of various sorts. They maintain a reproducible steady state, but this state is not a matter of equilibrium, indeed it is definitely not in an sort of "balance" at all. If the supply of energy and materials falls below the appropriate level, this state cannot be maintained—death and dissolution follow. On the other hand, if a surplus of energy is available, these systems grow and become more complex. Perhaps the simplest analogy I can give is that of a toy balloon with a small leak. As long as we can keep pumping in air, we can keep the balloon inflated. To accomplish this it takes material resources (air) and energy (to pump the air). If either of these is not available the balloon soon deflates. 3) When you see the economy as a dissipative structure, it becomes clear why energy plays such a critical role. What may not be quite so clear is why cheap fossil fuels are particularly important. We'll get to that shortly. Years ago I started out thinking that money was what made the economy work. And money certainly has it's uses—as a medium of exchange, a unit of account and a store of value. But money is really just a set of tokens representing something much more fundamental—energy. There was a time when almost all the energy used to make goods came from muscles, human and/or animal. We gradually developed tools and machines which made better use of that muscle power, but the industrial revolution didn't really get going until we learned to convert other forms of energy into mechanical energy to drive those machines. Primarily the energy of falling water and moving air (wind) and the chemical energy stored in biomass and fossil fuels. Fossil fuels are a very concentrated source of energy and easy to move to where that energy is needed, so they quickly become very popular. The other great thing about fossil fuels was that their price (basically just the cost of getting them out of the ground) was only a tiny fraction of their value in terms of the goods they could be used to produce. Thus the productivity of coal fired factories was much higher than that of muscle powered cottage industry. This led to a couple of centuries of unprecedented growth, fueled first by coal and then by oil and natural gas. And if that was the whole story, our industrial civilization would be doing just fine. They are not renewable on any sort of timescale that is useful to the human race. We have already used up most of the easy to get at, high quality sources, the "low hanging fruit", so to speak. In the oil business this is known as "conventional oil", as if that sort of oil is the rule, rather than the exception. There are lots of hydrocarbons left to dig/pump out of the ground, seemingly enough to last us a very long time. But they are either harder to access (tight oil and gas, deep offshore oil) or lower quality (heavy oil, tar sands, lignite coal). We have recently developed technology that allows us to access and use more of these fuels. But this technology is expensive, both in terms of capital investment and the amount of energy needed to build, operate and maintain it. Convenient as they are, burning fossil fuels releases carbon dioxide, which causes climate change with all its negative consequences. For the purposes of the economy "surplus energy" is what's actually important. The "surplus energy" of an energy source is what's left over when we subtract the amount of energy required to access the source. A closely related concept is EROEI, "energy returned on energy invested". In the "good old days" of oil, it only took one barrel's worth of energy to get 100 barrels of oil out of the ground, leaving a surplus energy of 99 barrels. This corresponds to an EROEI of 100 (and a surplus energy of 99), and it means that in energy terms, that oil was cheap. Today, even conventional oil has a much lower EROEI, in the range of 10 to 30, and "fracked" oil or tar sands oil has a EROEI in the range of 3 to 5. As far as fossil fuels go, this ongoing reduction in EROEI is a pretty definite trend. Note that an EROEI of 3 gives a surplus energy of 2, part of the reason that low EROEIs are a problem. If we look at the average EROEI of all the energy sources used by an economy, it can tell us a good deal the current state of the economy as a consequence of the availability of surplus energy. When the average EROEI drops toward 15, economic growth slows. As it drops further, it becomes difficult to raise capital for new construction or maintenance of existing infrastructure. Below 10 it is unlikely that a modern industrial economy can be maintained at all, and we would be forced to change to something less energy intensive. To put this in perspective, the average EROEI of the world today is around 11 and it is headed lower. It looks to me like all those low EROEI hydrocarbons in the ground aren't going to do us much good. Note: it appears that the pdf file with world economic data is no longer at that link. Here is a link to the file on my Google drive. Here is the blog post by Tim Morgan where the file was referenced. Renewables themselves have a low EROEI. When you add in storage equipment to level out the energy supply from intermittent renewables (wind and solar) you roughly cut the EROEI in half. Renewables generate energy in the form of electricity. But electricity only accounts for something less than 20% of our energy use. The rest is currently powered directly by fossil fuels. Some of this energy use promises to be very difficult to convert to electricity. Renewables might seem to solve the climate change problem, but the change over to renewables itself would require burning a whole lot of extra fossil fuels, with the increased release of CO2 which that would entail. And of course, when an economy has a low average EROEI, raising capital for new projects is hard to do. All in all it seems unlikely that we'll manage to install anywhere near enough renewable energy sources to allow us to continue with "business as usual". Even our current relatively small scale efforts are contributing to "energy sprawl" (fields of wind turbine and solar panels popping up everywhere) and diverting capital from other important efforts. EROEI is a good sort of measure, in that it lets us avoid talking in terms of money, and provides a good indicator for the "health" of the economy. Energy prices in dollars (or whatever) can be quite misleading, as they are affected by many other things than the availability of surplus energy. During the last half of the 20th century almost every recession was preceded by a spike in the price of oil, which makes sense—cheap energy makes the economy grow and expensive energy slows it down. In the 1990s, though, the EROEI of oil had declined enough to stop real economic growth. Governments responded by adjusting the way GDP is calculated, to make the economic situation look better than it really was. Those same governments intensified their use of debt to stimulate the economy. In the financial sector of the economy, investors in search of high yielding investments substituted bubbles for real growth, first with the dotcom bubble and then with the housing and derivatives bubbles that led to the financial crash of 2008. Since then despite the creation of huge amounts of government and private debt, there has been no real return to vigorous economic growth. It's interesting to note what was going on with the price of oil while this was happening. In the late 1990s, the price of oil was around $12 per barrel. From there it went up more or less steadily to around $140 in August of 2008. With the financial crash, the price of oil fell off to about $30 per barrel and then with the so called recovery, came back up to around $100 per barrel. Then in late 2013 the price of oil started to fall, went below $40 per barrel and has not gone above $60 per barrel since then. Currently (May 2017) the price is just below $50 per barrel. Demand destruction: the combination of low EROEI and high prices 2009 to 2013 slowed the economy down and reduced the demand for oil (and other bulk materials like steel). With average EROEI getting continually worse, the economy is not recovering, even with the current low oil prices. Price wars: both the US and OPEC are pumping as much oil out of the ground as possible, keeping oil prices low. The low oil prices are having a destructive effect on fossil fuel companies, lowering their profits and reducing the development of fossil fuel resources. "Global reserves have been further inflated by adding reserve figures from Venezuelan heavy oil and Canadian tar sands— despite the fact that they are "more difficult and costly to extract" and generally of "poorer quality" than conventional oil. This has brought up global reserve estimates by a further 440 billion barrels." This and a lack of understanding of the economic results of low EROEI, have led some to believe (especially in the US) that "drill baby drill" is the right strategy. Resources needed elsewhere are being used on low quality fossil fuel projects. In my opinion, it would be better not to waste capital on accessing lower EROEI fossil fuels, to accept the inevitable energy decline and try to make the remaining fossil fuels last longer, especially for uses that don't involve burning them. Now you may have been wondering what all this has to do with catastrophic/existential threats, but as we shall see shortly, the anthropogenic threats listed at start of this post can be viewed as disruptions to the Earth Systems and Human Systems shown in Figure 2. And interactions between our economy and its energy supplies are at the heart of those disruptions. They can be classified as primary, secondary and tertiary effects, based on their position in a cascading stream of cause and effect. It has taken us a while to get here but now, at last, we will take a look at those threats and how they fit into the biophysical economy. The individual threats appear in bold in the discussion below. To my way of thinking, the primary threat is resource depletion. The diversion of resources for our use disrupts the ecologies which rely on those resources. Examples would be our over use of water, arable land, forests and fisheries. Note that we ourselves depend on those ecologies, so we suffer as well. The use of those resources has led to a good deal of success for the human race and this, in the form of overpopulation and over consumption is a problem in itself. Then there are all the immediate consequences of the depletion of resources on which we rely. This certainly applies to non-renewable resources, in particular fossil fuels, on which we rely to keep our economy running. As the resources become depleted we are forced to move to lower EROEI energy sources, and the economy suffers as a result. But even renewable resources are also being depleted as we use them at a rate faster than they are being renewed. And lastly, there are the effects from the degraded byproducts of our industrial processes, especially the release of carbon dioxide into the atmosphere from the burning of fossil fuels, agriculture and forestry. The secondary threats are consequences of our profligate use of resources and their resulting depletion. Earth Systems are disrupted by the downstream consequences of resource use. We use the environment as a sink for the byproducts of our industrial processes. Pollution, in other words. And when there is a sufficiently large amount of pollution, the Earth Systems can no longer cope and start to be damaged. This contributes to ecological disasters. While there are many different types of pollution, carbon dioxide and the resulting climate change is the one that is currently of greatest concern. There is much that could be done to reduce CO2 emissions and slow and eventually stop climate change, but most all of this involves reductions in the burning of fossil fuels, resulting in even less surplus energy to drive an already stressed economy. Inside the economy, the decreasing EROEI of the fossil fuels we are using causes economic contraction, which has a whole bunch of downstream consequences. Our current financial system is optimized to facilitate economic growth and it does not work at all well when the economy starts to shrink. Businesses turning to automation to counteract the effects of economic contraction cause even more unemployment (economic singularity). The depletion of fossil fuels, fossil water and plant nutrients like phosphorous, along with climate change, are leading us towards an agricultural crisis. This is intensified by an ever growing population. The first sign of this happening is the increasing cost of food. which hits the poor first and hardest, leading to some of the tertiary threats. Populist politicians with overly simplistic solutions gain power by making promises they have no idea how to keep and which largely couldn't be kept in any case. Right wing extremists in the west and Islamic extremists in the Middle East both react to economic stress and take violent actions which allow them to feed off each other. The mass media perpetuate misconceptions about what is going on and what it would take to fix it. And so on. And if, as all this disruption progresses, should there be a massive solar flare or an asteroid strike, we'll be hard pressed to do anything but take it on the chin. So, to get back to where we started, is there any action we can take to prevent this perfect storm of threats? Well, if you mean any action that will allow us to keep business as usual rolling along with "good" growth numbers, I think the answer is pretty clearly no. Our industrial civilization is going to collapse, to some greater or lesser extent. We can't prevent this, but we could take action to mitigate its effects, turning it into a slow and relatively gentle crash. I've written a series of posts called "A Political Fantasy" that goes into detail on that. As you might guess from that title, I think there's a big difference between what "could" be done and what is actually likely to be done. Still, I don't think the situation is beyond hope. What we can't avoid, we can adapt to. We need to drastically reduce the human population, and it looks like events will take care of this for us. We need to drastically reduce the amount of energy we are using, and again, it looks like events are going to do the job for us. Those with problems taken care of all we need to do is find ways to keep some fraction of the human population alive through all these events. And again, we won't have to make any horrible decisions about who to get rid of. Even with all of us trying as hard as we can, only a few of us will succeed. It would we helpful to have a rough idea of what's ahead and the sort of things that will help to see us through. And, perhaps even more importantly, a clear idea of what won't help so we can avoid wasting time and effort where it would do no good. My next series of post, Collapse Step by Step will deal with exactly those issues. To leave you something to chew on, I will say that forward looking people should be considering a move to a better location: well above sea level, out of the path of tropical storms, where it rains regularly, it isn't too hot and the population density is already low. If such a location was beyond walking distance from large urban centres, it would be ideal. And if you can make such a move before the majority of the population catches on, have time to get set up and reduce your reliance on the monetary economy, and become part of the local community, so much the better. Energy and the Wealth of Nations, by Charles A. S.Hall and Kent A. Klitgaard. Two possible doomsday scenarios are also posed by nanotechnology, which is distinct from biotechnology and AI. Gray Goo is defined as, ‘runaway nanobots’: A swarm of rapidly self-replicating nanobots, in a ravenous quest for fuel, could consume the entire biosphere until nothing remained but an immense, sludge like robotic mass. Terrorists could get their hands on an apocalyptic, but small, amount of lethal toxins. As many as 50 billion toxin-carrying devices—theoretically enough to kill every human on earth—could be packed into a single suitcase. Active nanobots can be programmed to specifically get and kill humans. Military departments are currently studying this threat. massive solar flare (coronal mass ejection)"
You forgot a Supervolcanic eruption of Toba, Yellowstone or La Garita Caldera. Hi Jim, nice to see you're reading my blog. I'm not sure if you are pulling my leg about nanotechnology as a serious threat. In the previous post in this series I talked briefly about nanotech and discounted it as a serious threat, but perhaps I need to go into a bit more detail. Back in the day (late 1980s) when Eric Drexler was first publicizing the idea, he was big on self-replicating nano-scale computers and robots. And there was a concern that if they got out of hand, they might convert everything into "gray goo". Your "human killing robots" are the same kind of machines. Not only do we not have these machines at present, but we aren't even trying to develop them. Based on this, I eliminated nano technology as a credible threat and didn't include it in my final list of threats that we should be worrying about. If you need something to worry about, there are lots of other things on the list. It sure makes a great plot device for science fiction stories,though. Hi RE, nice to hear from you. In the second post in this series (http://theeasiestpersontofool.blogspot.ca/2017/03/evaluating-existential-threats-part-2.html) I did discuss super volcano eruptions as a possible existential threat. I did some reading on the subject and the scientific consensus seems to be that none of the supervolcanoes currently appears to be nearing an eruption. By that I mean that they are unlikely to erupt in the next few decades or even centuries. Sometime in the next few millenia, maybe. A major eruption of this sort would indeed be catastrophic, at least for those living downwind, or perhaps on a global scale if it caused something like a "nuclear winter". But even a few decades from now we are likely to be post collapse and unlikely to be able to anticipate such an eruption, warn those in danger or evacuate them to a safer location. And what can anyone do about a "nuclear winter"? So I decided not to add this to my list of things worthy of worry. I guess you might ask why I included asteroid strikes, based on the same criterion. At some point it does come down to a gut feeling, and I went with mine. The overall point I was trying to make is that threats like resource depletion, climate change, overpopulation, agricultural crises, etc. are much more of a risk and yet mainstream society doesn't take them seriously and is effectively unwilling to do anything about them. And here's a link to a commentary on nano technology. It goes into more detail on what I was basically trying to say: nanotech is largely snake oil.